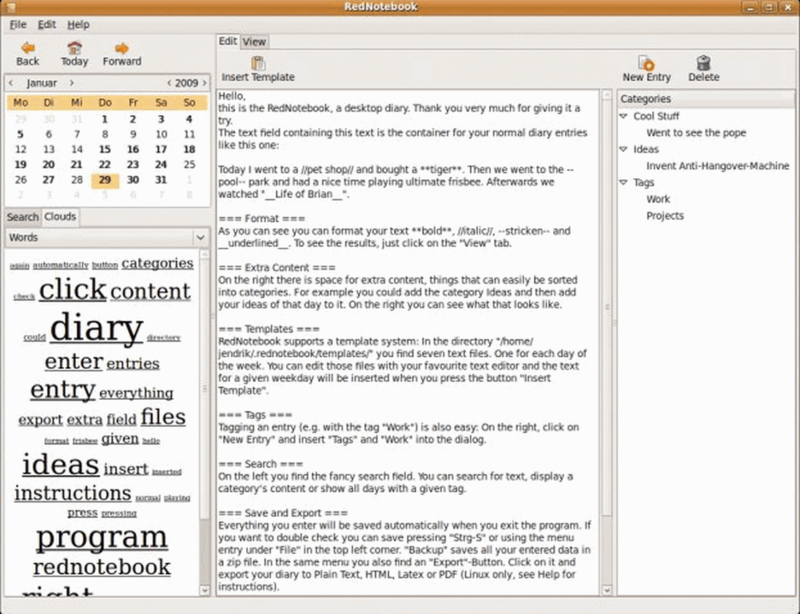 RedNotebook is a modern journal that includes a calendar navigation, customizable templates, export functionality and a "cloud" box containing frequently used words and tags. The program also includes spell check, formatting, insert images, files and links, automatic backup, templates, export to multiple formats. You can also format, tag and search your entries. Your data is stored in plain text files - no database needed. Cross-platform and available in more than 30 languages. Alternatively, RedNotebook Portable is stealth, smaller, re-opens your last journal and has faster startup times. X-RedNotebook is also available. Open \files\default.cfg with a text editor and change "portable=0" to "portable=1"
it seems that currently it is available for Linux only. The latest version available for Windows is 1.15. The project seems to have moved to GitHub. Downloads (Windows .exe and source archives) are here: https://github.com/jendrikseipp/rednotebook/releases. The link to Windows versions on the website now links to there. I have not tested it for portability. 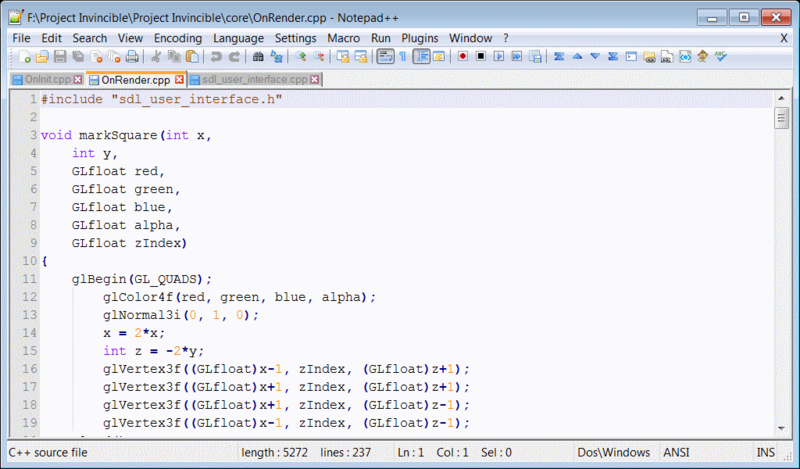 Notepad++ is a tabbed source code editor and Notepad replacement with a customizable interface. Includes source code "folding", allowing users to quickly reduce and expand sections of code to see the overall document. In addition, it features multi-language syntax highlighting, auto-completion, Perl-compatible regular expression search/replace, macro recording and playback, document map etc. The program can access a long list of plug-ins via an easy-to-access menu with even more features and functions. Alternatively, X-Notepad++ and Notepad++ Portable clean the local folder. How to extract: Download ZIP or 7z package according to your OS and extract to a folder of your choice. Delete unnecessary localization files. Launch notepad++.exe. My favorite editor for multi-tabbed editing. Feature-rich. Not stealth anymore, creates 'AppData/Local/Notepad++' folder. So in the 7.5.1 changelog it says it fixed the above 'AppData/Local/Notepad++' folder bug, but I'm still getting them, can anyone else confirm? TagScanner is a multifunction program for organizing and managing your music collection. It can edit tags of most audio formats, rename files based on the tag information, generate tag information from filenames and perform any transformations of the text from tags and filenames. Album info available via online databases like freedb, Discogs or MusicBrainz and includes a built-in audio player. Supports ID3v1, ID3v2, Vorbis comments, APEv2, WindowsMedia and MP4 (iTunes) tags. Includes powerful TAG editor with batch functions and special features and a playlist maker with ability to export playlists to HTML, Excel or any user-defined format. How to extract: Download the "portable" ZIP package and extract to a folder of your choice. Launch Tagscan.exe. 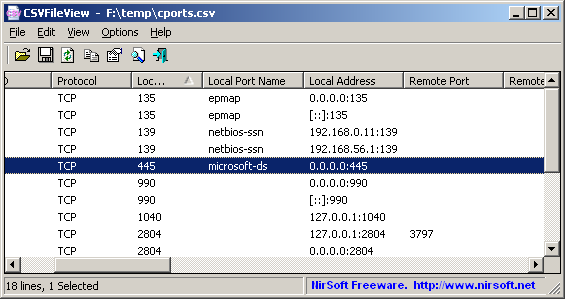 'Open file location' command works more clearly and don't create additional explorer.exe instances. Case change feature failed on some locale.